Hiroko Utsumiya (nee Kohara)'s father went to war while she was still in her mother's womb -- and later died in battle. "Sometimes, I wondered if he really existed," she muses. "There are times when I have felt him to be nothing more than a shadow." This month, the 71-year-old Utsumiya suddenly received numerous items that her father once possessed. They had been kept by a woman in the United States whose father had been on the same battlefield as her father, and had taken them home. While their respective fathers had likely crossed each other's paths as enemies in combat, their daughters went on to find connection with one another 70 years after the war's end. Utsumiya's father's belongings had been taken back by the U.S. soldier as war booty. They included a flag of the Rising Sun upon which the phrase "Success in combat with continued good fortune" had been written in large letters, along with others' signatures crammed in; as well as a "sennin-bari" (thousand-stitch belt) that had been sent to him by family members, and a small notebook with photos of his wife and parents inside. Inscribed in the notebook was a military record that all Japanese soldiers kept, inside which a U.S. soldier had scribbled, "Killed Jap." From the context, this was understood to mean, "I killed a Japanese person." The belongings had been kept by Marsha Lynn Crowell, 60, a resident of Los Angeles, California. Her father had entered the military in 1942, at the age of 19. He was sent to the Philippines, and returned to the U.S. after having fought against the Japanese. Crowell's father worked in construction following the war, and died in 1980 at the age of 57 without having spoken much about his experiences in the war to his only daughter, who goes by Lynn. She describes him as a quiet, gentle person who loved nature. While he was still alive, Lynn says, her father had told her that the objects -- which were kept on the back of a shelf -- were articles that he had brought back from the war front. After her father's death, Lynn recalls, she picked up the articles and realized that she couldn't continue to just hold on to them. That said, however, she had no idea what to do with them. Several decades went by, and the issue continued to tug at the back of her mind. Last year in late September, while visiting Canada with her husband, Lynn ended up sharing a taxi with Kanagawa Prefecture resident Mai Furukawa, 30, who was traveling there on a business trip. They hit it off, and ended up going out together for a meal. They also continued to stay in touch after returning home. It was at this time that Lynn confided in Furukawa regarding the items that her father had brought back, and asked for help in locating the soldier's family. Furukawa's first thought at the time was, "My only connection is that I am Japanese. This has nothing to do with me. And it's such a heavy story." She was drawn in by Lynn's passion, however, and after learning about this newspaper series, she came to see me in October of last year. Together, we then set about trying to locate the soldier's relatives. Our clues included the flag, the name "Usaku Kohara" that had been inscribed in the notebook, and the military record. Also included among the information was the name of the military unit to which the soldier belonged, as well as an old place name that was presumably his hometown. According to historical materials, Kohara's unit had been sent to the island of Leyte in the Philippines, where they were helpless in the face of the overwhelming force of the U.S. military. In July 1945 -- just before the war's end -- the unit was apparently almost completely obliterated. The military record kept in Kohara's notebook ended in the month of June. Here was his entire record from the time he had entered his unit until his life ended. But where were his family members? I used the place name mentioned in the notebook to search through telephone numbers and maps of neighborhoods, and I also got in touch with organizations that I thought might be able to point me in the right direction. Still, however, finding him seemed out of reach. Almost no members of his unit returned from the war alive, and any relevant military veterans'-type groups were no longer active. Early in December 2015, just when I had all but given up, someone from the Okayama Prefectural Government office got in touch with me. They had located the soldier's relatives. With his belongings in hand that I had received from Lynn via Furukawa, I set out to the city of Okayama. Taking the objects in her hands and gazing at them, Utsumiya said these words with deep feeling. She also appeared flummoxed. "Suddenly, my father's presence just feels so much larger." Until I shared what I knew, Utsumiya said, she had only been told that her father had died "somewhere down south." "I suppose that being here to accept these belongings was something that my father and mother assigned me to do," she mused. Utsumiya's mother, Sadako Kohara, had passed away in 1977 at the age of 54. Always a hard worker, she had learned how to sew and cook, and raised her daughter on her own. Before she died, she never discussed the war. Regarding Utsumiya's father, she shared only positive memories: "He was fashionable." "He was a salesman in Kobe, and we used to go shopping together in Osaka." Sadako also erected a headstone with her own and her husband's name engraved upon it. When Utsumiya was small, she and her mother used to go there to pay visits, and once a relative said to her, "You look just like your father." The only way that Utsumiya was able to know her father was through several photographs. Gazing at the photos, her mother once murmured, "It's only me who has aged." Utsumiya read her father's notebook, which included the following sentence referring to her mother: "I read Sadako's letter." It was the first time that Utsumiya had ever seen her father's handwriting. "I had always been told that he was very neat and well-organized, so I imagined that his penmanship must have been amazing," she commented, and then added with a smile, "But it's really nothing special. Somehow, this makes me feel relieved." With respect to the phrase "Killed Jap" that had been scribbled into the notebook, Lynn recognized that it matched her father's handwriting. She felt uneasy, and hesitated about whether or not she should hand it over to the soldier's family, thinking, "They might hate me." Thinking of Lynn's feelings, Utsumiya said, "We cannot change the historical fact that the war took place. The only thing that I want to say to her is thank you for having kept (my father's belongings) in such good condition for such a long time." 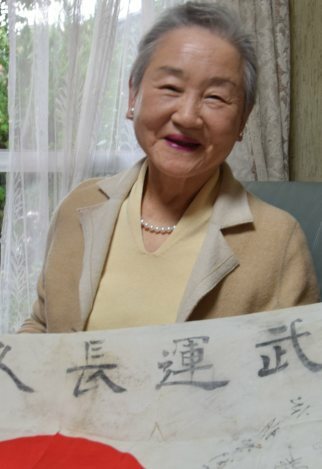 With the notebook now back in its owner's hometown, Utsumiya commented, "I suppose that (70 years since the war ended) is perfect timing for both Lynn and myself to have the belongings returned now, since I am now able to receive them in peace." Utsumiya also gave me a letter to pass along to Lynn. "Thanks to you, Lynn, I am able to welcome my father home," it read. "I thank you, and so does my mother." On Dec. 18 of last year, Furukawa took Utsumiya's letter and went to the United States. Unexpectedly having become a bridge between Japan and the United States, she said prior to leaving, "Even if we come from different countries, our love for our families is the same. Now, I can say that I am glad I became involved in this story." Several days later, I heard from Furukawa again. Lynn had read Utsumiya's letter, and had gone to sleep that night in tears. She sent along a message in response that returning those items had been the one and only thing that her father had left for her to do, and that she had finally been able to do so. She wanted to thank Utsumiya for the generous way in which she received them, she said.